The AHC has recently processed the papers of Irwin Kostal, an American composer, orchestrator and arranger in the 20th century. Kostal’s most well-known projects include work on The Sound of Music, Mary Poppins, Sail Away and Chitty Chitty Bang Bang. Kostal was also involved with the orchestration of the original stage show for West Side Story in 1957 and he shared an Academy Award for his work on the score of the 1961 movie version. Kostal also won an Academy Award in 1965 for his work on The Sound of Music and was nominated for Academy Awards three other times. In addition, Kostal conducted the digital re-recording of Disney’s 1940 film Fantasia. Kostal’s papers at the AHC focus mainly on Kostal’s work on Broadway, with original and copy scores from the musicals Tenderloin, Fiorello!, Sail Away and A Funny Thing Happened on the Way to the Forum. Kostal’s collaborations with Julie Andrews, the star of the film versions of Mary Poppins and The Sound of Music, are documented as well, in addition to Kostal’s work on a variety of television shows and commercials. However, the centerpiece of the collection (in my humble opinion) is the material related to Kostal’s work on the film version of West Side Story. The West Side Story materials are important not only because of the continuing popularity and influence of the work, but also because of the creative process the materials document through the inclusion of inserts detailing the transition from West Side Story (the musical) to West Side Story (the movie). 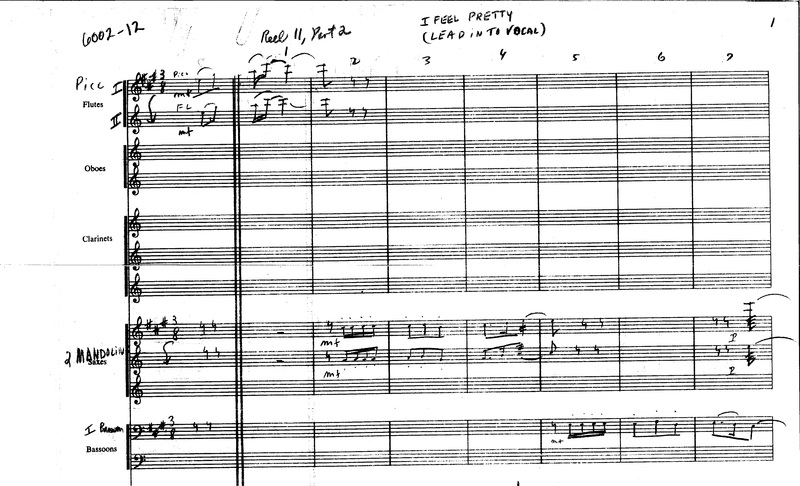 “I Feel Pretty!” First page of the song, “I Feel Pretty,” from “West Side Story.” Irwin Kostal papers, Box 36, #3423. UW American Heritage Center. Such transitions are often the responsibility of music arrangers. Arrangers are people that take an existing work and adapt it for presentation through the development of melodic themes, reharmonization and/or adding transitions between songs in a musical work. The Kostal papers provide researchers with an avenue to study these transitions firsthand and help bring greater detail and understanding to one of America’s musical and cinematic classics. As an institution, the AHC places a great deal of emphasis on collection material that documents the creative process behind the products of popular culture and the arrangement work in the Kostal papers related to West Side Story does a great job of illustrating the creative choices Kostal and the others made in regard to the music ultimately included in the film. The Kostal papers are a part of the strong holdings the AHC has related to the arrangement and composition of American music in the 20th century. Other examples of AHC holdings include the John Scott Trotter papers, the Perry Botkin papers, the Eugene Poddany papers, the Frank DeVol papers, the Fred Karlin papers, and the Carl Stalling papers, among others. This entry was posted in Composers, newly processed collections, popular culture and tagged Fiorello!, Irwin Kostal, Sail Away, The Sound of Music, West Side Story. Bookmark the permalink.